Eagle’s Eye staff writers review and discuss the differences between the movie adaptation of the book The Hate U Give. The Hate U Give is a story about a girl named Starr who is switching between two lives one in the poor, mostly black, the neighborhood where she lives, and the rich mostly white prep school where she attends. The balance between the two worlds is broken when she witnesses a shooting of her childhood best friend Khalil by the hands of a police officer and she is pressured from different sides of her community to stand up for what she believes is right. This is a movie where it demonstrates the views from the side where it shows the hard truth of how society is facing police brutality and how sometimes the world can be unfair. In this situation, the police officer doesn’t get charged with murder and the officer ended up winning the case. The movie helps humanize the young characters beyond what we often read in news stories. Amandla Stenberg, who plays Staar, shows what it is like to be divided between two worlds: the prep school where she goes to school and her original neighborhood where her friends and family experience police harassment on a regular basis. I give this movie a good 4 out of 5. It’s interesting and makes you want to know what the characters are going to do next. Â The director does a good job of showing how these types of events actually affect people’s lives. It’s refreshing to see a movie with young people dealing with serious issues instead of cliché teenage drama. 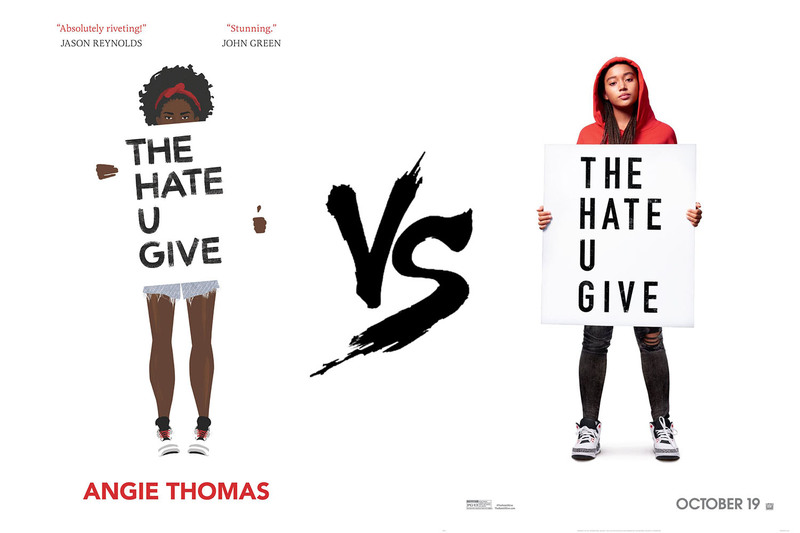 People most likely know what The Hate U Give is from watching the trailer or seeing the movie, but not many are aware that its actually an adaption of Angie Thomas’ bestseller The Hate U Give published in 2017. In the book, readers follow the life of Starr Carter as she faces the challenges of living a double life: one being her life in Garden Heights, a poor, predominantly black neighborhood and the other being centered at Williamson, the preppy private school she attends across town. One of the most important parts of the book is “The talk” that Starr’s father has with her, and no it’s not the talk about the “birds and the bees.” It’s the talk about what to do if a cop stops her. Her father told her to keep her hands visible. The reason for this talk becomes painfully obvious after she and her friend are Khalil are pulled over on their way home from a party. Things escalate quickly after a misunderstanding with the officer, resulting in Khalil being shot by the officer. Sadly, this is not uncommon in America. The book realistically shows the struggles that minorities go through on a regular basis and helps the reader understand what it’s like to constantly live with the fear of facing a dangerous situation. Addressing this issue is what makes this a good read because it makes people more aware of problems they may not be facing themselves. It’s like a call to action because it could be used as inspiration to peacefully stand up for your rights.